What a crazy day it was. Just getting to this race was an adventure. Richard and I had decided to head to Dalton, Georgia early enough on Friday to be able to check into our hotel, figure out the time it would take us to drive from the hotel to the race start and pick up our race packets as well. Our crew/pacers (James Duncan, Mike Trice and Jay Naves) had planned to head up there early to set up an overnight camp and check out the aid station locations for the next day. As it turned out, those initial plans had to be adjusted as North Alabama was unexpectedly pounded by thunderstorms and multiple tornadoes just as we all planned to leave for Georgia. Richard and I decided to leave for Georgia after the initial tornadoes touched down in an effort to stay ahead of the storm and get to Georgia before the weather made its way there. Our crew decided to stay with their families until the worst was over. They would leave around midnight to drive straight to the race start as camping was no longer an option considering the severe weather that was now moving west. Thankfully, no lives were lost during the tornadoes that almost nixed our trip to Georgia, but my heart goes out to all the folks who lost their personal property and will have to rebuild from scratch. Rich and I arrived in Dalton, GA around 2PM on Friday afternoon and headed straight to Chatsworth and Fort Mountain State Park to pick up our race packets and check up on a very good ultra running friend of ours, Dan Burstein, who had by now already been running for close to 34 hours. This crazy guy had registered for the race a long time ago and had to back out from the official race due to a family conflict that weekend. So instead of backing out of the race altogether like a "normal" person would, he decided to run the inaugural Double Top 100 solo and more or less self-supported (his one person crew back out in the last minute) exactly 24 hours before the start of the official race. While I have no doubt Dan would have been able to complete this event completely and entirely on his own, I as reminded once more of why the ultra running community is just different than any other group of athletes I have ever been associated with. Another good ultra running friend of mine, Ronnie Hines, had heard that Dan had lost his only crew and so decided to be there for Dan as much as he could. And he did. Ronnie basically crewed Dan through the night and did not leave him until later that following morning to catch some sleep. Why you ask did he leave to get some sleep? Well, Ronnie was also registered to run the DT100 the next day and had now been up crewing Dan for almost 2 days, risking his own ability to attempt a finish at the DT100. There was also Brad Goodridge who was in the same situation as Ronnie and still decided to help out Dan to finish this thing. In the end, Dan completed his challenge and Richard and I were fortunate enough to catch up with him just before he started the final 10 mile section after the Cohutta Overlook. Dan, you are indeed the man! Prior to catching up with Dan, Richard and I drove my Jeep up to Fort Mountain State Park to meet RDs Perry and Kena to pick up our race packets. Just the drive up to the state park was intimidating, to say the least. We continued to slowly climb up the mountain for about 7 or 9 miles, barely ever even seeing a guardrail to separate us in my old 2-wheel drive Jeep from the abyss. It was flat out scary. It didn't help either to find out later that other racers who arrived the day before had to have the passenger hang their head out of the passenger door to watch for the road surface below as the fog was so thick, you couldn't see the road below your car. Guardrails would have been reassuring in that situation, I thought. Regardless, Richard and I made it to the state park in one piece to pick up our race bibs and t-shirts. Once Vikena handed us our bags, I managed to bribe Perry to give us a glimpse at the finisher's buckles. Well, that's not entirely true. I basically threatened not to give him a ride to pick up his rental car unless he showed us the buckle;-) Thanks Perry, that glimpse gave me the motivation I needed. After dropping Perry off at the rental car center, Richard and I headed back to Dalton for some carb loading at Tony's restaurant, where we ended up getting some excellent Italian food and an ice cold beer before heading to our hotel. By 8PM, Rich was sound asleep and I managed to watch TV for another 30 minutes before passing out myself. My alarm went off at 2:30AM, allowing me time to shower as we planned to leave for the state park around 3:15AM. Before I got up, I checked James' Twitter feed and received the first bad news of the day. While our crew waited out the storm in Huntsville, Jay got sick with a high fever. So before the race ever started, our crew was already down to 2. Oh well, it just meant even better planning than before, which wouldn't be a problem. Our crew consisted of engineers and boy scouts, nothing could go wrong and it really didn't, at least not from a crewing pr pacing perspective. Instead of meeting us at the starting line of the race, our crew James and Mike met us at the hotel. After a quick chat about the aftermath of the tornadoes at home and a review of the weather forecast for the race, we jumped into our cars and slowly headed towards the state park. We arrived at the park around 3:50AM or so, enough time to hang out and see who else was running. I started to search out a couple of buddies and I soon found Enoch, Ronnie and Brad. I am always in a better mood when I see familiar faces at the start of an ultra race. You know it's gonna be a long day and you would have a chance to swap the latest ultra stories with everyone. While the rain had stopped in time for the race start, the temps weren't quite as mild as I had hoped. Thankfully, the drop bags had not been taken to the aid stations yet, so I started scrambling through by bags for an additional layer of clothing. With five minutes to spare, Perry directed all of us to head into the parking lot for the start of the race and with an informal "ok, it's time to go" from Perry, we were off. We started down a road within the state park before we were directed onto the first section of single track trail, I believe it was the Cohutta trail. We would run along this trail and up a serious powerline cut section before we even made it out of the state park. Cool, the race had barely started and we were already climbing. At least we knew right away what type of race this would be...a tough one! The first few miles were dark and foggy and I quickly engaged Enoch and Ronnie into our usual banter while Rich was surging slightly ahead of us. However, by the end of the powerline cuts section, Rich and I had lost sight of both Ronnie and Enoch. Oh well, I knew they would catch up to us later on. After all, it would be a long day. After just under 7 miles, we reached the first aid station at Bearpen and it was still dark. I grabbed a couple of orange slices for breakfast but forgot to refill my bottle and so did Richard, duh! Since I forgot to refill my bottle, I had the stretch the remaining contents of my bottle for another 6 miles. Luckily, it was still early in the race and I had enough time to make up for that mistake without having to pay for it. We breezed into the second aid station at the Cohutta Overlook as the sun was slowly rising on the horizon. Our crew was meeting us here for the first time to check in with us. Mike and James had switched vehicles and were using my old Jeep as the crew shuttle. Once we reached the 52 mile turnaround point, they would alternate as pacers for Rich and I for the remaining 50 miles. At least that was the plan. Richard and I were both feeling really well. No issues, no pains, no heavy breathing. This time, I refilled my bottle, grabbed a piece of banana and continued on. I had gotten used to a basic food schedule, one gel and two SCaps every hour and one bottle of fluids between every aid station. I continued this schedule throughout the race until the final 6 miles. We continued on our journey and started to wonder if there would every be a flat section during this race. So far, it had mostly been an uphill race and we continued to climb, climb, climb. I had created a pacing plan for myself that I shared with Richard and our crew. I planned to run the first half in 13 hours, which would be just over 15 min per mile pace. For the second half, I allowed myself 17 hours or slightly above a 20 min per mile pace. While I was much better trained this time than in my previous two 100 mile finishes, I did remember how much I struggled in the second half of both of these races. Tiredness during the late hours, blisters on both feet, those were things I remembered all too well, because they reduced me to a mere walk for almost 40 miles in both races. While I hoped to avoid that same fate this time around, I couldn't bet on it, so instead, I tried to come up with a reasonable game plan. However, if this didn't work, I would be just as happy to finish. I just wanted to try to be out there no more than 30 hours. The Georgia Jewel took me almost 34 hours to complete and I just didn't want to be out there that long, if I could help it. Richard and I arriving at the Cohutta Overlook #2 aid station. I guess I should have told Perry about that, because his course certainly didn't take my goal into consideration. Instead, it seemed more likely that I would be out there longer than ever before. I was still looking for a flat section, just 200 yards, 100 yards, anything, please! Oh well, I guess not. As we entered and exited the third aid station at Conasauga Three Forks, I spotted a couple of runners entering the aid station just a couple of minutes after we left. Crap, I already felt chased. Why was that? It must be my competitive nature, I guess. But I quickly reminded myself to stick to my original game plan and if those two runners would catch us, so be it. It was going to be a long day. Eventually, the two runners did catch up to us and I was glad I had decided not to try to stay ahead of them. As it turned out, it was Ronnie and Enoch who had finally caught up to us. We all ended up running the next 20 miles or so together and it really made time fly. Our crew continued to meet us at every crew accessible aid station and we continues to move through pretty efficiently. By the way, according to the RD, there wasn't going to be any creek crossings but one, where runners' feet would get wet. Someone should 've told the creeks about that. Due to massive rainfalls the night before the race, we actually had to wade ankle and even knee deep through quite a few creeks (I stopped counting after 5). While it is actually a lot of fun to do, I quickly became concerned about my feet. So far, I had blistered in every ultra event beyond 50 miles and I was certain that the wet creek crossings wouldn't help. As it turned out, my feet actually stayed almost completely blister free with the exception of a couple of toe blisters. I swapped shoes and socks a few times, but not until the 52 mile turnaround point. Richard and I cruising on one of the few downhills. I continued to stay on target pace feeling great. The next aid stations came and went and time flew as the company around me made it very easy to enjoy even the toughest climbs at this point and believe me, there were many many tough climbs and not a lot else. Our crew continued to take care of us and I continued to choke down one gel and two Scaps every hour. Everything went according to plan...until mile 41. Richard started to slow down on one of the climbs complaining about an upset stomach after just having stopped at an aid station for some food. This is nothing unusual for Richard and he usually recovers after a few minutes of walking. I continued to climb with Ronnie and Enoch just behind me, but Rich started to fall behind. After the climb there was a nice downhill and I just leaned forward for some easy running. Before I knew it, Richard was out of sight and I decided to stop and check on him. I really wanted to make it to the halfway point together, but he really needed to try to recover first, so we decided to split. I was hoping he would recover and catch me later. About a mile later, I also lost touch with Ronnie and Enoch, who were slowing down a little on the climbs while I continued to try to power hike each climb while running each downhill. This race strategy paid off as well, although I was initially worried that the sheer number of climbs would really cost me significant time if I continued to walk every climb. The weather was perfect during the day. When I reached the turnaround, James notified me that Richard had texted him and had pretty much decided to drop from the race as soon as he made it to the turnaround. He did recover, but looking at the race clock, he just didn't feel like possibly being out there more than 30 hours. That meant Mike would join me as a pacer for the next 10-13 miles. He and James had decided to swap pacing/crewing duties every 10-13 miles until the finish, which meant each one would run about 25 miles alongside me. I was glad to have such a great crew around me as the night was as tough as I expected. The temperatures dropped quickly and I continued to add layer upon layer until I couldn't add any more. I had switched from hand bottles to a hydration pack at the turnaround to keep my hands free during the night, I figured it might be helpful to have both hands free while stumbling through the North Georgia mountains in the middle of the night, sleep deprived and tired. Thankfully, I didn't take a single fall nor did I turn my right ankle. I had decided to run without an ankle brace for the first time since tearing my peroneal tendon at the Dizzy Fifties race in November. It was a gamble that paid off. I was able to avoid the blisters on top of my foot that I had developed during a 100K just two weeks ago as a result of wearing the brace and I didn't reinjure my ankle, win win all around...phew! While the weather stayed dry, we did have to deal with strong and cold winds every time we would reach the top of switchback or the peak of a mountain or just another ridge line. The only way to stay warm was to keep moving and so I did. We continued to surprise our crew by showing up early at aid stations and that really gave me a boost of confidence. I wanted to keep that streak going. However, it was now dark and I was over 60 miles into the race and I started to slow down here and there, managing the occasional burst of speed as Mike and James can attest. But I was still banking minutes against my goal pace. I wasn't really capable of doing math anymore but I knew I was still making up time. It was a great feeling. I started to realize that I was having a great race. It seemed my training was actually paying off. Mike and James continued to encourage me and as we continued through the night, we continued to hear stories of lost runners and bonus miles. I felt bad for everyone affected by that and i was just glad that I managed to stay on course. I know how demoralizing it is to go off course, especially in a 100 miler. My pace continued to slow, but I continued to be ahead of my goal clock. I didn't know by how much, but I tried to hang on. Encouraging words from my crew did the rest. Most of the late night really is a blur to me other than I was really cold for most of it but I managed CFM, which was key. I do remember aid station volunteers mentioning lost runners and the fact that I was somewhere in the top ten. What? That couldn't be right. I'd only been in the top ten once before in an ultra (which happened to be two weeks earlier at the Fuego Y Agua 100k), but never before, let alone in a 100 miler. Wow, that's kinda cool, I thought. But surely, the other runners will catch me sooner or later. So i just decided to enjoy it while it lasted. I remember telling Mike or James, "dude, remember that I was top ten in this race at some point, otherwise no one is gonna believe it". At least I think I did. As we continued to make our way from aid station to aid station, I slowly moved up in the rankings, not down. Runners dropped or got lost, but I also caught a couple. Wow, every time I moved up a slot I started to feel stronger. Weird. I was now in the top six and we only had 10 killer miles to go. By now it was James turn to finish the race with me and we continued on our way. I was told that the next runner was only a couple of minutes ahead of me, but I remembered her passing me earlier around mile 75 or 80 with an ease that made me wonder. How is that possible? How can she be running this strong this late in this race? I just admired her and told Mike. Yeah, there is no way I'm gonna try to keep up with her, she is flying down this course. What happened next can only be described as surreal. We had exited the Cohutta Overlook aid station a while back and I was just focused on moving one foot in front of the other as were were moving through an area with lots of creek crossings and I was already dreading wet feet. It was still dark when I noticed what seemed like big headlamps, no headlights behind us. What the heck was that, James? I was freaking out. I was too tired to think straight and thoughts of the movie Deliverance did cross my mind. James confirmed that it was a couple of 4-wheelers. What? 4-wheelers, at 6AM on Sunday morning? This didn't make any sense. Within two minutes, they caught up to us. I told James to step aside with me to let them pass, but they stopped and started shouting at us. Huh? What's the idea here? "Tell me your race number" one of them shouted. I responded and asked them why they needed to know. "This race is over!" he replied. Before my brain could even process a reasonable response I shouted back "Oh no, it's not!" It went back and fourth a couple of times before I told him that I was continuing my run and that I was headed to the state park and no one was going to stop me. James hung back a little and I started to "sprint". There was NO way anyone was going to stop me from finishing this thing. I was 24.5 hours and 94 miles into this thing and I was going to get that buckle. Five minutes later, they stopped us again. I was thinking to myself "What the h@! !, I'm in a race here, quit stopping me!" I continued to walk while they proceeded to explain to James that they were involved in some type of search and rescue situation. Either way, I was not in the mood for any more discussions and I continued on. As James can confirm, I had quite a few choice words describing this particular situation and I want to apologize right here and now for the thoughts that went through my head at that time. S&R is a serious situation, but all I could think of was the finish line. I continued to press and right after this strange encounter, we caught up to the runner who had passed me so easily around mile 75. She was with her pacer and we briefly discussed the whole encounter with the local rescue team. One thing was clear, she wasn't going to stop either. Just as we approached the final aid station, I made a push to pass her and after checking in at the aid station, I continued on without stopping. I wanted to hold on to the top 5 spot I believed I just gained. Until this point, I just wanted to finish in under 30 hours, maybe 29? However, when I realized a top five finish was in the cards, I really started to push. So much so that I briefly lost my pacer during the climb to the finish. After a brief confusion about what trail to take to the finish, I caught up to another runner. However, this guy was not going to go down without a fight. Instead, he smoked me during the uphill. There was no way I was going to catch this guys, so I kept it steady, trying not to blow up 2 miles from the finish. With about a mile to go, I caught up to him again. After a brief chat about what direction to take, I told him that we should just finish this race together as I was not going to challenge him for what I thought was third male overall. I was quite happy to finish fifth. I crossed the finish line after 27 hours and 51 minutes, way below my sub 30 hour goal. I was ecstatic. This was my best finish yet and when I received the official results two days later, I realized that I had actually finished 4th overall and 3rd male overall. I couldn't have been happier. To do this well on a course of 102 miles with >22,000 feet elevation gain according to Garmin (and even more gain according to other tools) was very rewarding and encouraging to me. My training paid off and I can't wait to do it again. Due to different circumstances, only 13 runners out of 33 starters finished the race. The official results can be found here. After a quick shower and an unreasonably large breakfast at the local IHOP, Richard, James, Mike and I returned to Huntsville. I want to take this opportunity to thank Perry, Kena, James, Mike and Richard and all of the volunteers who so graciously agreed to spend their free time out there supporting us runners and allowing us to enjoy this amazing adventure. This is one scary course profile. Nice work! Good job on the training and keeping your head in the game with challenging circumstances. Congratulations! So the Search & Rescue was looking for one of the lost runners? Perry told us by email that a runner's significant other called 911 after she didn't make the finish line in a reasonable time after the Cohutta Overlook aid station. BTW, the guys on the 4-wheelers first told us that 40 people were missing. No joke, 40 PEOPLE! The second time they stopped us, they told us that there was a guy with a hurt knee who had called for assistance. I don't know that they really knew why they were out there. Nice work Martin! What a crazy event, good thing you paid close attention to the correct race route. Sounded like a total cluster F! Too bad the course didn't take you through the Bear Creek section of the Pinhoti, that was the most awesome piece of Pinhoti single track I experienced on my speed hike; and the huge Gennett Poplar tree! Wow! You'll have to go back to see that area. Amazing. However there were like a million creek crossings down in there as you pass from drainage to drainage so perhaps that's why the RDs bypassed it...? Great work, I ran the 100k and met lost runners some took that right turn back onto the Pinhoti after A/S 4 instead of continuing up FS 68/64. The course was marked and we were all given maps. Thanks for the post, I am planning a 100 miler in the future and it is good to have that insight. Not sure if you will get this (as this is an old post), but I am coming down from Boston with some friends to run Double Top this year. I've been researching as much as I can about it, and the elevation profile you have at the end of the blog is exactly what I've been looking for, but haven't been able to find. 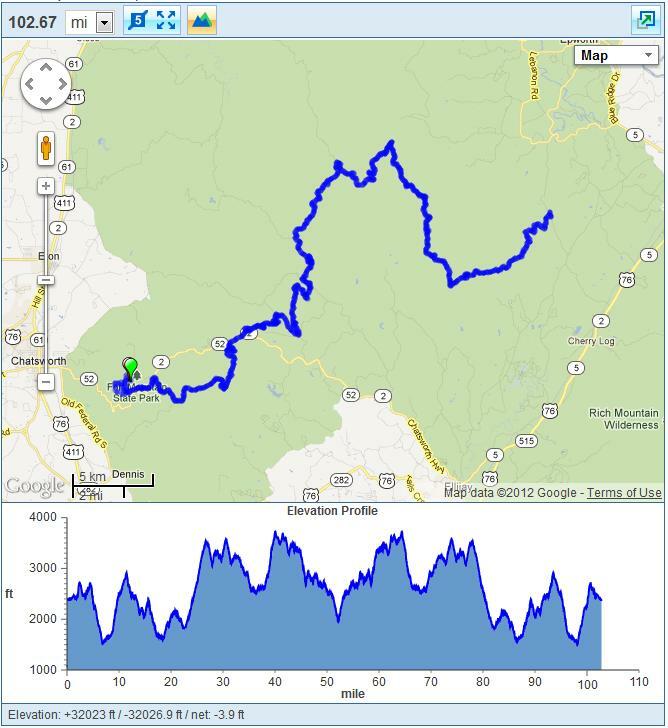 Is there any chance you have a link to where I can find that map/elevation profile - I'm interested in analyzing some of those climbs a bit more closely (how long they each are, the grade, etc.). Any/all help would be greatly appreciated. My name is Josh Katzman (I just tried publishing a comment, but not sure if it worked). The short version of what I just wrote: I'm running Double Top in 2013 and have been looking for a really good elevation profile. The one at the bottom of your post (sounds like quite the adventure!) is the best that I've seen. I was hoping that you might have a link to that map/elevation profile, so that I can analyze those climbs a bit more closely. Any and all help would be appreciated. Thanks in advance and hope all is well. check out my Garmin Data at http://connect.garmin.com/activity/155181191. That elevation profile doesn't look quite as clean, but you can export the file and go to runningahead.com and import the data file there to get the exact view you saw above. Hope this helps and let me know if you have any other questions at all regarding this race. This is great - thanks for the help! Perhaps I'll see you at the start (and finish) line in a couple of months!